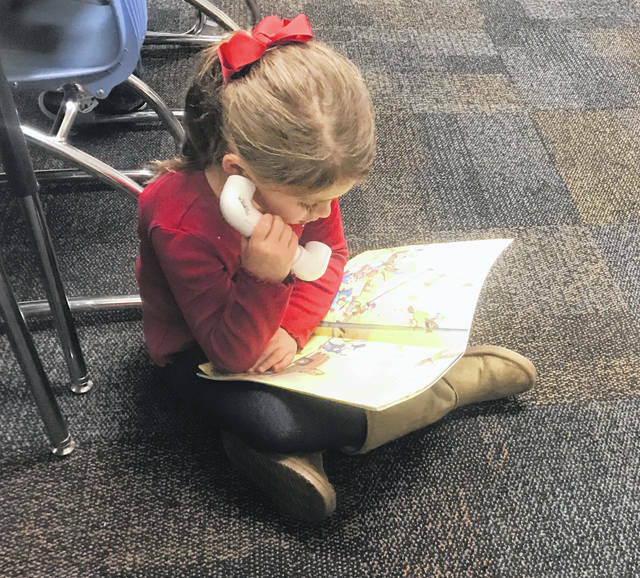 First grader Reese Imm uses a whisper phone to read. 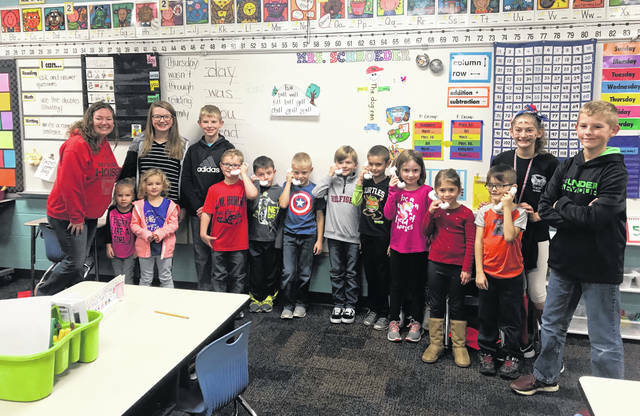 Ignite Youth Group Leader Natalie Blackburn, left, and youth group members Tori Blanks, Jacob Freyhof, Amelia Schmiedebusch and Cameron Freyhof present whisper phones they made to Teacher Schroeder’s first graders. Indian Lake Elementary School students mastering their reading skills have new tools to help them hear their progress! Several Indian Lake students involved in the Indian Lake Community Church Ignite Youth Group presented “whisper phones” to each kindergarten through second grade classroom. A whisper phone is a small, lightweight auditory feedback device. It allows a child to speak softly into it while listening to the clarity and rhythm of their words. This instant feedback encourages the child to make any necessary adjustments to their fluency or pronunciation as they speak. Blackburn says RJB Sales and Service of Lakeview donated the piping and supplies for the devices. Youth group members made a total of 160 whisper phones, 10 for each classroom per grade level.